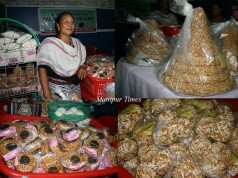 Two or three decades back, the indigenous Manipuri Kabok varieties such as Kabok Khoidum, Sana Kabok, Chini Heingal, Lalu etc were in high demand in the markets of Manipur. 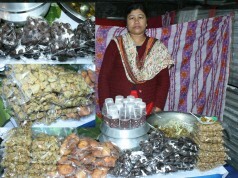 It was because of the fact that these items were the most favourite Ngamok (locally made sweetmeats especially for children) in every household of Manipur. Mothers used to bring Ngamok for their children when they returned home from market or somewhere else. In due course of time, packaged snacks and sweetmeats imported from other states and neighbouring countries have gradually taken the place of locally made Ngamok. Nowadays, people hardly buy these local items except for religious ceremonies like Lai Haraoba, marriage ceremony, shardha ceremony, swasti puja etc. 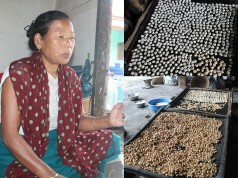 KshetrimayumTombi Devi, a woman Kabok vendor at Thoubal Keithel shares Manipur Times about her concern over gradual diminishing of Kabok items. In her vendor, she puts items like Kabok Mori, Kabok Muri, Kabok Afaba, Kabok Khoidum, Sana Kabok, Kabok Boon, Phoukhoibum, Kabok Akhingba, Lalu (small, medium and big size), Chini Heingal, Chengpak, Chuhi and many others for sale. Different Kabok varieties including Chengpak are made from rice. Left out residues from Kabok making is used in preparing Lalu. 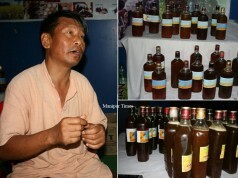 60-year-old Kshetrimayum Tombi Devi, wife of late Ksh Loken Singh, hails from Thoubal Awang Leikai. 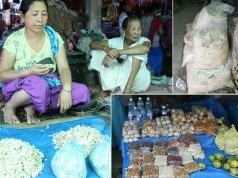 She has been selling different Kabok varieties at Thoubal Keithel since past 35 years. Her late husband was working in Irrigation and Flood Control Department (IFCD), Government of Manipur. After the demise of her husband, Tombi’s life became suddenly woeful. She was reeling under hardships as she was the only bread earner in her family. The family was not that inadequate when Tombi’s husband was alive. With her husband’s salary and her income earned from selling Kabok items, they could easily manage the family. The untimely demise of her husband left behind all the responsibilities on her shoulder. Almost all the family properties were lost in her husband’s treatment. The family was experiencing heavy bankruptcy at the death of Tombi’s husband. With the meagre income earned from selling Kabok, Tombi was maintaining her family. Whenever Tombi closed shop due to ill health or any other reason, they even slept empty stomach on many occasions. She could not afford to her children’s school admission fees, tuition fees. God helps those who help themselves; the condition of her family is not that bad as earlier now. Tombi has been working so hard that the financial condition of her family is also improving leaps and bounds. She has cleared all the debts and even possessed a piece of paddy field of her own. “With all of my four children have grown up and started helping me, I am now able to breathe a sigh of relief up to some extend and those hard toiling days have become past woeful tales, even though memories still exist in my mind,” recalled Tombi. 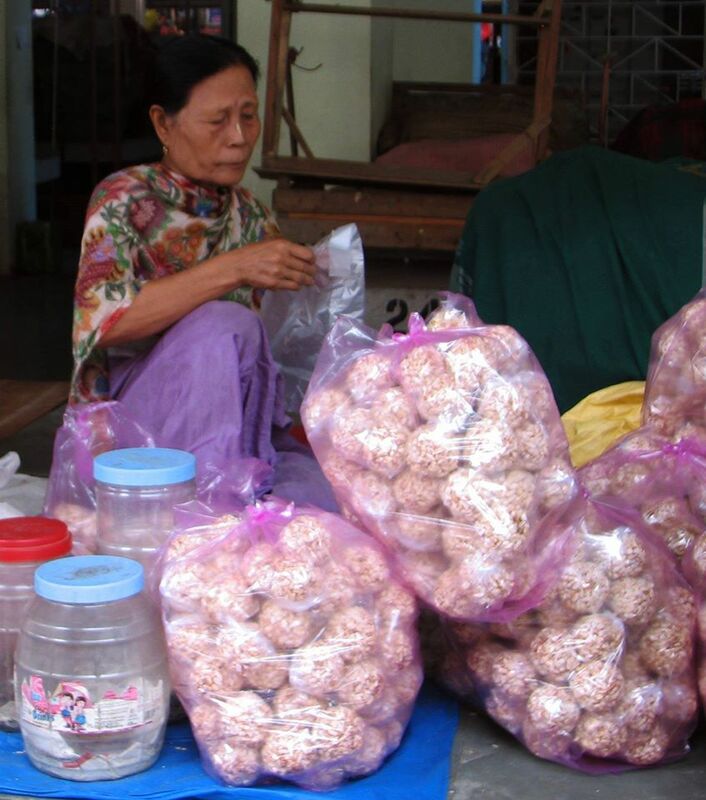 Her sons and daughters always help Tombi in her business in terms of preparation of Kabok and Ladu items. 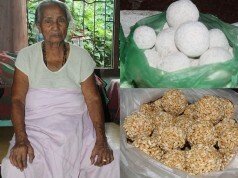 The different varieties of Kabok are made at her house with her children and then brought to Thoubal Keithel for sale. 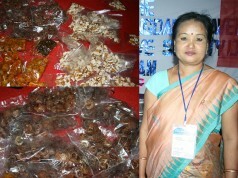 She used to procure bags of rice from the nearby localities to prepare Kabok of different varieties. The rice grain is fried in a Khang (pan) to change it into Kabok. With that, it is mixed with Chuhi (unrefined local sugar). Ball-like Kabok pieces are prepared by holding it tightly with hand, Tombi explained to Manipur Times while talking about the process of Kabok making. Nowadays children’s love for indigenous Kabok has decreased to a great extent with almost all the local food items have been dominated by imported snacks like Uncle Chiefs, Lays, Kur Kure, Rice Noodles and others. 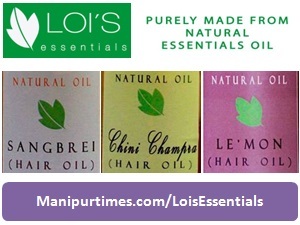 Moreover, many food items made in Myanmar and China etc are imported to Manipur through Moreh. 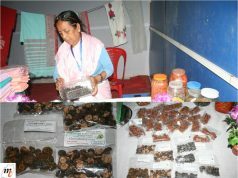 It has given a serious impact to women Kabok dealers in Manipur who always take a pivotal role in shouldering the socio-economic burdens in many Manipuri families. Due to less number of customers, women Kabok sellers nowadays hardly get profit from this business. 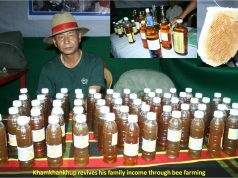 Such local food items which are unique in the world and serving as an identity of the state need to be encouraged by the people. Otherwise, it will get extinct someday, observed Tombi.